The event that sparked the war occurred in late June, when Archduke Franz Ferdinand, heir to the Austro-Hungarian Empire, was shot to death by a Bosnian Serb nationalist. 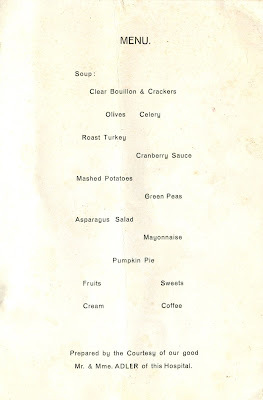 At the time of this incident, the American doctors and nurses assigned to Budapest could never have imagined where they would be having Thanksgiving dinner that year. 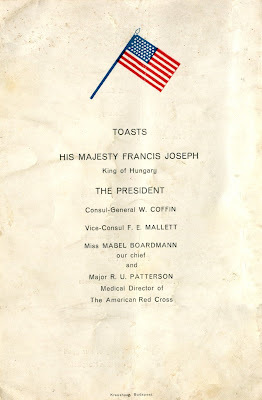 The menu below includes the roster of the Red Cross unit and the names of three countesses who volunteered at the hospital. 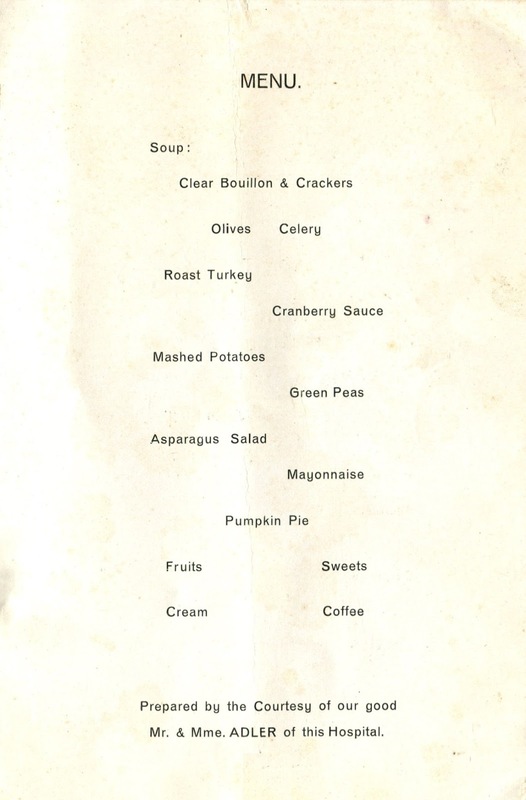 The nobility of the Austro-Hungarian Empire had given the Americans a warm welcome and probably helped arrange this traditional holiday meal. 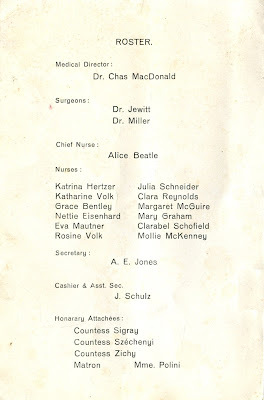 Although the medical team had only been there for about two months, they had already felt the shock of this catastrophic war. Unlike those working in the Allied countries, the units in Germany and Austria-Hungary experienced no lull at the beginning of their assignments. The endless waves of casualties began to arrive immediately, requiring them to work seven days a week. Various supplies came from royal donations, although some of the fabrics were so richly decorated with lace, buttons, and gilding that they proved unsuitable for use as hospital linens. By the end of 1914, well over a million soldiers had been killed on the battlefields in Europe, and there was no end in sight. 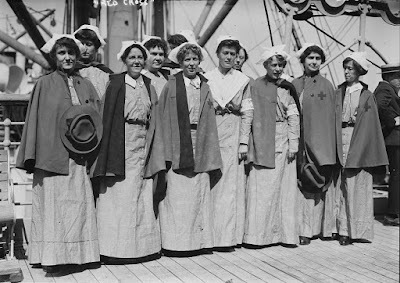 Having become physically and psychologically exhausted, many of the doctors and nurses returned home in March 1915 when their six-month terms ended. They were replaced by fresh crews. However, two months later, a German U-boat sank the S. S. Lusitania, causing public opinion in the United States to shift further toward the Allies. As a quasi-governmental organization, the American Red Cross found it increasingly difficult to operate as a neutral. In October, all personnel were recalled except for two newly-established units in Belgium. 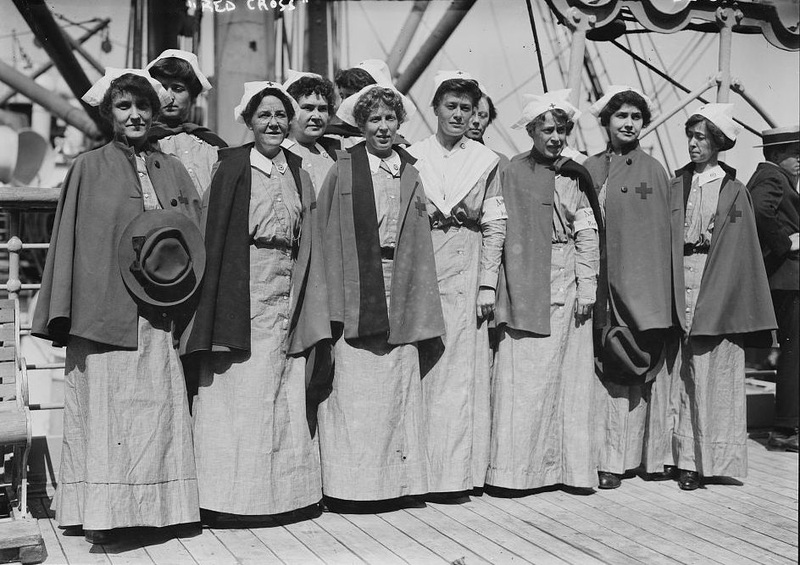 A total of 75 doctors and 255 nurses had served in Europe during the twelve-month period.2 The United States would not enter the war until 1917. In the meantime, the Ambulance Americaine continued to operate in France. This military hospital was organized in 1914 by a colony of wealthy American expatriates. 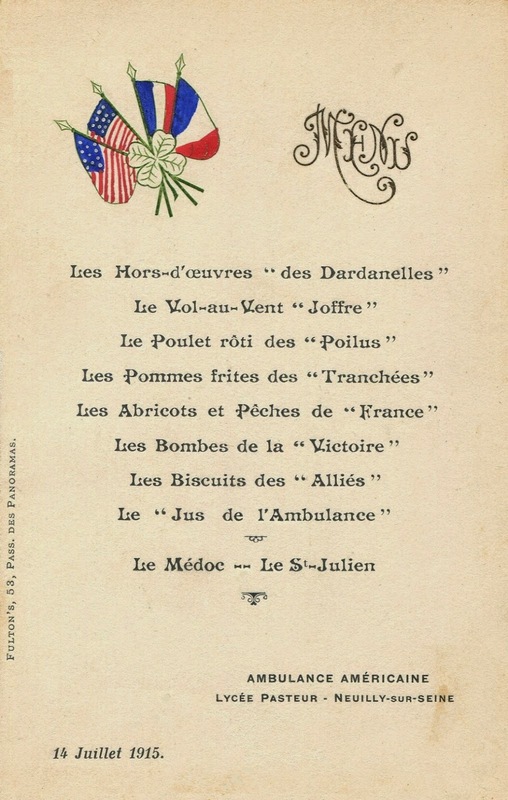 While the professed goal was to provide medical aid for the casualties of all nations, its location in a northwest suburb of Paris precluded it from being nonaligned. The Ambulance Americaine received a steady stream of doctors and nurses who arrived on a three-month rotation from the United States. 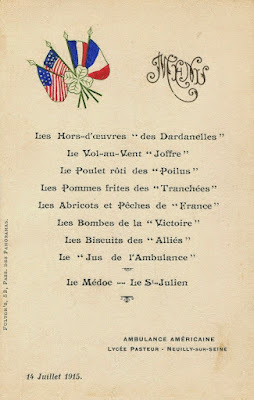 The menu below comes from their dinner on Bastille Day in 1915. The Great War never lived up to the hope that it would be “the war to end all wars.” Today, independent organizations like Doctors Without Borders impartially provide emergency medical aid. 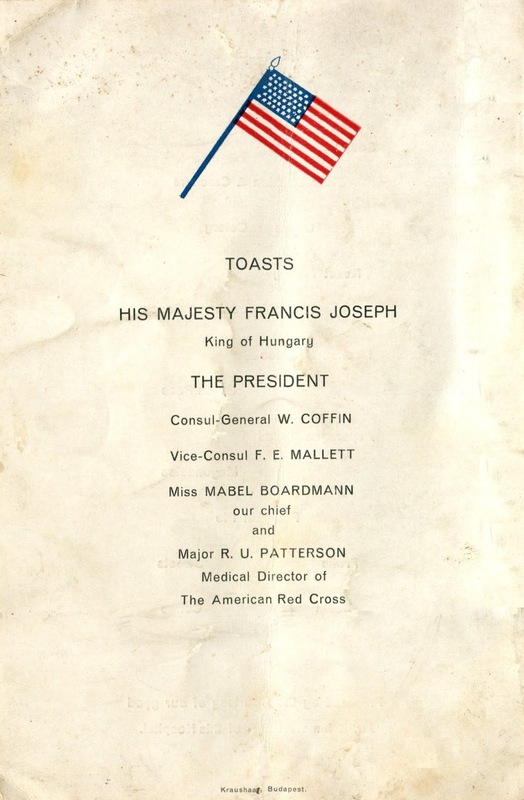 Such groups are able to sustain operations though private funding, such as that employed by the Ambulance Americaine, combined with the strict neutrality of the American Red Cross mission. 2. 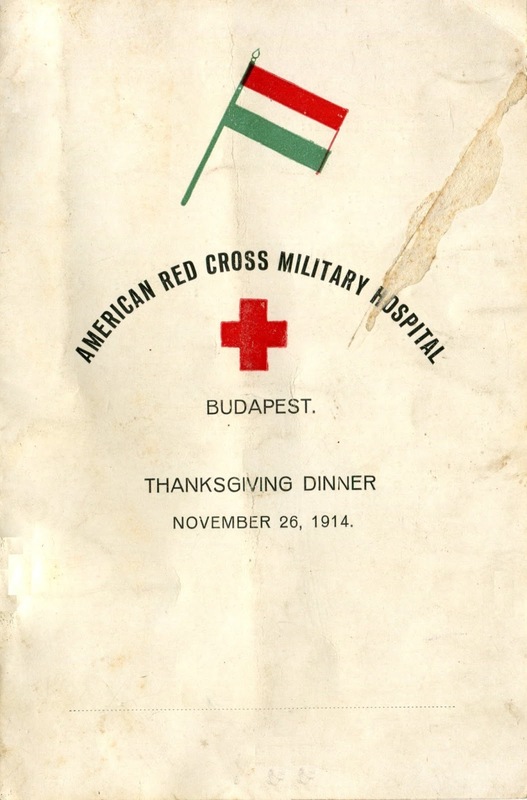 Summing up this experience, Jane Arminda Delano, head of the Army Nurse Corps and the American Red Cross nurse corps, said “We have learned that women can be mobilized without confusion, that their chances of illness when carefully selected seem to be no greater than men’s and that they face danger with equanimity.” By 1917, over 8,000 registered nurses would be trained and ready for duty.